As we sat down and had a look at the films coming out for this year, we chose 10 which I guess may not look very original, but we want to see them none the less. 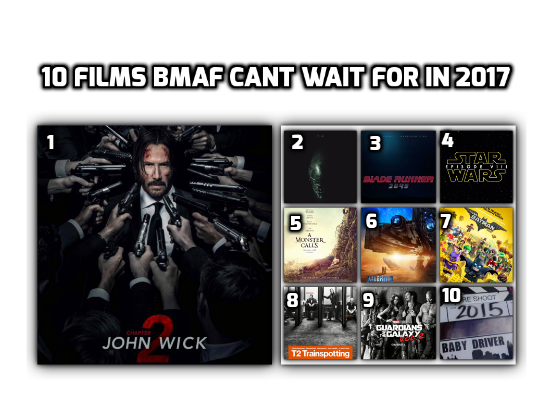 Plenty of others we considered such as the new Pirates of the Caribbean movie; Murder on the Orient Express; War for the Planet of the Apes; Kingsman 2; Paddington 2; The Mummy and even Baywatch! The truth is the following are the ones that have captured our attention the most, but we are sure will not match our end of year top 10! A cast that includes the likes of Lily James; Kevin Spacey and Jamie Foxx, this makes our list as from director Edgar Wright, who gave us the likes of Shaun of the Dead and Scott Pilgrim vs. the World, we love his films and this being his first since 2013’s The World’s End, we can’t wait for this one! We struggled with this one, yet again we have a wealth of comic book films on the way, but we enjoyed the first one so much, we went for this one. Marvel also bring us a new Wolverine film Logan for its harder rating and Thor: Ragnarok due to Taika Waititi directing excite us too. DC Comics will be looking to raise their game with Justice League and Wonder Woman so we will see. We hope Wonder Woman being first female-led film of this genre does well. One we really can’t get excited about is Spiderman: Homecoming, does this franchise really need a 3rd reboot? This makes the list on more of a nostalgia reason than any of the others, it was the first film with its Britpop soundtrack and its achievements it did for British Film that made it for us, with the cast and crew returning for the sequel, we hope they can capture the magic again. Based on a graphic novel, the trailers look like this could be something special, we are hoping for this to be a Luc Besson classic, like Leon or the Fifth Element but this could turn out to be as poor as his Joan of Arc. This will be our first film of 2017 no question, with the film from J A Bayona, the director of creepy The Orphanage and tense drama The Impossible, we have high hopes for this being as good as our well-read copy of the book it is based on. Blade Runner is one of our favourite movies of all time, we have the box set which contains all the various versions and with Harrison Ford returning as Deckard, Hampton Fancher returning to write the script plus Ryan Gosling, that should excite anyone, but add Denis Villeneuve as director, on the basis of his Sicario and Arrival, this really could be something special, and unlike the original, get big box office success. This film from director Ridley Scott owes us big time, we felt Prometheus whilst a good film, just did not manage our expectations and at the time felt really let down by the lack of the Alien in the film. So far this seems to be promising to correct that this time. We have our reservations, especially with James Franco and Danny McBride on the cast, as we associate them more with comedic roles, but it is a minor fear as from what we have seen so far, and with Michael Fassbender, the highlight of Prometheus returning, we really think this could be an Alien film to love as much as the first 2. The first John Wick film we absolutely adored, even if we can hardly watch the opening, but the passion John shows to take out anyone involved with harming his dog delivered in every way. This was a great action film and unlike franchises like Taken and The Expendables, this has not gone for a lower rating for its sequel. At a recent facebook live, they promised it would be a cliché to kill another dog but other than that, we can expect to be thrilled as much as the first, and with a Matrix reunion of Keanu Reeves and Laurence Fishburne, we are counting down the days for this one. What about you? What films can you not wait to see in 2017?